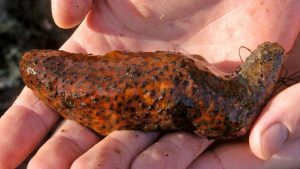 SEATTLE- The owner of a Washington seafood company has been sentenced to prison for overharvesting sea cucumbers. Federal prosecutors said Friday that 62-year-old Hoon Namkoong was sentenced to three years in prison and must pay $1.5 million in restitution. He pleaded guilty earlier this year to underreporting the number of sea cucumbers he bought from tribal and nontribal fisheries in the Puget Sound by nearly 250,000 pounds (113,400 kilograms) between 2014 and 2016. Namkoong’s company, Orient Seafood Production, sold them in Asia and the U.S.
U.S. Attorney Annette Hayes says 62-year-old Hoon Namkoong’s actions will impact sea cucumber numbers in the Puget Sound for years to come. The long and tubular bottom-dwelling creatures are cousins of sea urchins and starfish and are featured in the cuisine of China and other southeast Asian countries.